Ostara has already established a reputation for high quality trade paperbacks of out-of-print detective stories and crime novels under various thematic imprints such as College Crime, Clerical Crime and Medieval Mysteries. For Top Notch Thrillers, they have brought in critic and award-winning crime-writer Mike Ripley as series editor. 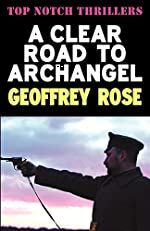 The first four Top Notch Thrillers, published this week, are Snake Water by Alan Williams, The Terrible Door by George Sims, Night of Glass by Philip Purser and A Clear Road to Archangel by Geoffrey Rose. Eight more titles are expected in 2010. Tracking down authors and agents turned into something of a quest for Ripley. He found Geoffrey Rose, who only wrote three novels, living in retirement in southern England despite the fact that his original publisher had lost track of him in 1980.